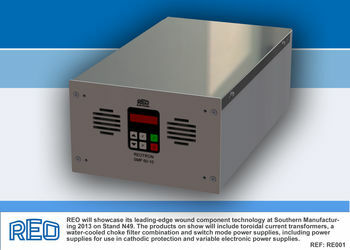 REO will showcase its leading-edge wound component technology at Southern Manufacturing 2013 on Stand N49. The products on show will include toroidal current transformers, a water-cooled choke filter combination and variable switch mode power supplies, as well as power supplies for use in cathodic protection. REO toroidal current transformers measure AC and DC current from 0.1-3000A. All current transformers can be manufactured to customer requirements, typically for circuit boards or for installation in switch gear cabinets, and can be manufactured to comply with the appropriate UL, CSA (Canadian Standards Association), European and international safety standards. Tested in REO’s in-house test laboratory, the company’s wound component production expertise guarantees that its new range of current transformers exceeds customer requirements. REO’s design competencies, including choke design, radio frequency interference (RFI) filter, water cooling and bespoke engineering to customer specifications, are showcased in microcosm by a special Combination Filter used in the control scheme for a vacuum pump used in semiconductor manufacture. The unit is used with a bespoke variable speed drive (VSD) in a regenerative application that returns power to the network. It is essential that the regenerated voltage and current is free of harmonics and radio frequency interference (RFI). Water cooling efficiency is 95% which reduces cabinet size and ensures component reliability and longevity. For many years REO has manufactured and developed power supplies for use in cathodic protection (CP) applications. The REOTRON SMP range is a switch mode alternative to conventional power supplies for a multitude of applications, and provides several advantages. “Remote monitoring, control and maintenance of cathodic protection is becoming more important as it allows cost effective and accurate measurement of the performance of a given installation at any time and without large survey costs,” explained Steve Hughes, managing director of REO.